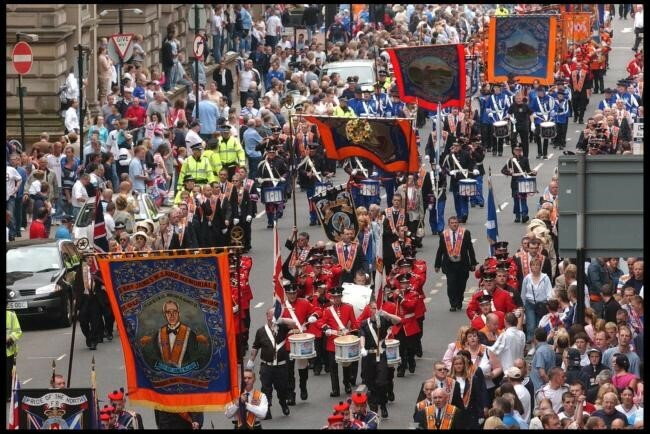 Orange marchers take to the streets of Glasgow. The Sunday Herald revealed last year that the first prize in a fancy dress competition organized by Airdrie-based Whinhall True Blues Flute Band and held in an Orange Hall went to a man and woman dressed as Adolf Hitler and wife Eva Braun, and two children dressed in rags branded with a yellow star similar to the one Jewish people were forced to wear by the Nazis. Other pictures of the 2013 competition, and an earlier contest in 2010 show men dressed as Catholic clergy, and one who appears to be dressed as the Pope has a noose around his neck to simulate a lynching. The Order has also come under fire after footage emerged from the crowd at an Orange Walk in Glasgow singing the banned Famine Song, accompanied by a flute band. In the video shot last July, a group repeatedly sing: “The famine is over, why don’t you go home?” Lyrics which refer to Irish immigrants. Eight people were arrested at the same event for a range of offenses. Recent reports in the national press have conveyed the impression that anti-Catholicism in Scotland has reached new and virulent levels of hostility in the last few years. The headlines are designed to shock: ‘Anti-Catholicism now Rife’ (Catholic Truth 29.11.2017); ‘Catholics are the biggest target of hate crime in Scotland’ (Sunday Times 18.3.2018, repeated in Catholic Herald 20.03.2018); ‘MSPs say sectarianism in Scotland is primarily an anti-Catholic problem’ (Scottish Catholic Observer 23.03.2018). An incident of desecration in a Catholic Church in Coatbridge also attracted media attention even though the local parish priest has said there is no evidence that it was a sectarian attack. A Labour MSP, Elaine Smith, the party’s inequality spokesperson, has now asked for more protection for the Catholic minority in Scotland in order to combat the apparent rise in hate crime. She echoes similar comments made in the recent past by the Director of the Scottish Catholic Media Office and the Director of the Catholic Parliamentary Office, which were made in submissions to Lord Bracadale’s current Review of Hate Crime legislation. Several voices have spoken out on this controversial subject so far, including journalists, church spokespersons, and politicians. One perspective that is missing to date, however, is that of academic researchers who have studied these complex issues over the years. This essay is written by an historian and a sociologist who both have long experience of examining the evidence for sectarianism and anti-Catholicism in the period since the Great War at the beginning of last century down to the present day. We present our findings here in the hope that reasoned analysis of the evidential base can trump alarmist claims, flawed conclusions, and exaggerated rhetoric. This is a topic where both an historical approach and definition of the subject under discussion matter. We need to briefly survey the past in order to place the present in context and so allow determination of how far things have changed, if at all, for good or for ill over time. There can be little doubt that this measure can indeed be applied to the life experience of many Catholics in Scotland, and especially to those of Irish birth or ancestry, over much of the twentieth century. 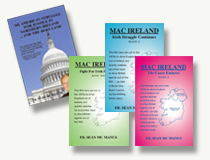 The notorious pamphlet published by the General Assembly of the Church of Scotland in 1923, ‘The Menace of the Irish Race to our Scottish Nationality’, was followed during the inter-war period by the Kirk petitioning the UK Government to end Catholic emigration from Ireland and deport back to Ireland those Catholic Irish in prison or on the poor law. The campaign became a noxious mix of sectarianism and racism. The memory of those times, handed down across the generations in family lore and tradition, helps to explain the sense of victimhood that can still be found among some sections of the Catholic community today. The American cousins of Scotland’s Irish Catholic population achieved occupational parity with other Americans as early as 1900. During the 1920s and 1930s, their counterparts in Australia and New Zealand did the same. In the 1950s, however, the ‘Scoto-Irish’ remained disadvantaged in terms of occupation, income, health, and education. Within a few decades, however, their position in Scottish society was transformed. The key drivers of this social revolution included the decline of sectarian employment practices, secularization, and a huge expansion in educational opportunities, not least comprehensive schooling and university expansion in the 1960s. Erosion of the old ways of patronage and nepotism led to a more meritocratic labor market based emphatically on qualifications, credentials and proven achievement. Analyzing the transformation through scholarly research also became easier. Political and public concern over sectarianism in Scotland led to the production of much new, accessible and robust evidence on the subject in social surveys, the census, which from 2001 contained information on religious affiliation and government-funded inquiries. The data clearly reveal that the social and economic emancipation of Catholic people has taken place in Scotland over the last several decades. If, as some assert, anti-Catholicism remains a feature of modern Scottish society, it has manifestly failed to constrain this historic development. – The 2001 Scottish Household Survey showed that for Catholics entering employment in the second half of the twentieth century there was no evidence of disadvantage. Further, the evidence of both the 2001 and 2011 censuses demonstrated unequivocally that there was little or no difference in the occupations of Catholics and those who defined themselves as Protestant. – Systematic labor market discrimination has become a thing of the past. Employment legislation and the system of tribunals which supports it ensures that cases of people claiming to have been treated improperly because of their religion are very rare. – a wide body of research into other key areas of inequality in education, health, and deprivation suggests that any religious differences there prove to be modest and in decline. – Leading Catholics have now cracked any glass ceiling which in the past might have inhibited their aspirations. In the past few years, six Scottish university principals were Catholic as were two previous Lord Advocates and the President of the Court of Session, Scotland’s highest legal officer. – the Orange Order, widely considered to be a traditional bastion of anti-Catholicism, is in a parlous condition with a declining and aging membership and its annual parades widely condemned by mainstream Scottish opinion. – An unprecedented level of ecumenical harmony has been achieved between the Catholic and Protestant churches. Indeed, in 2002, the General Assembly of the Church of Scotland formally apologized for its crusade against Catholics in the 1920s and 1930s. – Information on intermarriage and personal friendships hardly confirm the image of a Catholic-Protestant divide in Scotland. The 2001 census recorded almost 400,000 Scottish Catholics living with a spouse or partner. In almost half these cases that person was not a Catholic. The Scottish Social Attitudes survey of 2014 also showed that friendships across the so-called ‘divide’ were commonplace. 81 percent of those who identified themselves as Catholic reported having one or more Protestant friends. Equally, 76 percent of self-identified Protestants said the same of Catholic friends. – At the independence referendum of 2014 substantial numbers of Catholics in Glasgow and Lanarkshire abandoned any lingering suspicions of nationalism and voted YES. They would hardly have done so if they did not feel confident in their Scottish skins. – The denominational school system might still cause controversy among some and opposition especially from secularists, humanists, and bigots but has been widely praised by experts and politicians alike for the quality of its educational provision. In its final report, the Scottish Government’s Advisory Group on Tackling Sectarianism concluded that Catholic schools could not in any way be held responsible for this social problem. Finally, then, we come to address the issue of the annual hate crime figures published by the Scottish Government. These seem to have been the trigger for the recent claims about the continuing existence of widespread anti-Catholicism in modern Scotland. Concerns of ‘attacks’ on Catholics, or Catholics being ‘targeted’ on Scotland’s streets are alarming. And, in fact, they are unhelpfully alarmist. The focus of alarm appears to be the fact that most offenses aggravated by religious prejudice (which we might crudely shorthand to ‘sectarian hate crime’) are anti-Catholic in nature despite Catholics being a relatively small minority in Scotland. Thus, the latest available figures (published in 2017) show that of 673 religious aggravations reported in the previous year, 384 (or 57%) had Catholicism as ‘the subject of abuse.’ Since Catholics make up only around 15% of the population this is seen as clearly disproportionate – and so some clerics, church officials, and politicians are insisting that something must be done to stop the ‘violence’ and ‘attacks’ against Scotland’s Catholics. Yet the available statistics have consistently – since the introduction of ‘religious aggravations’ in 2003 – painted a somewhat different picture of the nature, extent, and character of religious hate crime in Scotland. Indeed – and ironically – the perception of widespread sectarianism has led to the routine publication of statistics relating to religious aggravations, but not to the others (race, sexual orientation, transgender identity, and disability). We thus know substantially more about religious hate crime than any of the others, and what we know suggests a rather less sinister interpretation of the ‘imbalance’ of offending. First, it should be noted that, despite the attention it garners, religious aggravations are by no means the most common form of hate crime in Scotland. Racial aggravations remain, by far, the most common kind of hate offenses, and aggravations based on sexual orientation have been, over the last five years, the second most common. One other point should be noted to place this evidence in a broader context. In 2016-17 in Scotland there were over 59,000 incidents of domestic abuse. Media outlets in their obsession with ‘sectarianism’ pay scant attention to these figures which outnumber so-called hate crimes against Catholics by something of the order of one hundred and fifty to one. This, then, is what we know about sectarian hate crime. Most such offenses occur in Glasgow and the surrounding west of Scotland, and the vast majority of offenders are relatively young and overwhelmingly male. Many offenses involve alcohol and drugs, and over half the victims are police officers or someone else doing their job. In only around a quarter of cases is a ‘member of the public’ the target of the offense – as frequently misbehavior was directed towards the world at large. Most perpetrators do not know the religion of their ‘victims.’ Tellingly, there are significant spikes in offending during the evening, particularly at weekends. The ‘claimed’ increase in sectarian hate crime is itself entirely dubious – 600-700 offenses seems to have been the common range in recent years. The peak figure of 900 came seven years ago in 2011. Media attention to sectarian hate crime tends to headline “victims,” “targeting” ‘violence,’ and “attacks.” However, relatively few such offenses are physical assaults (7% in 2016-17), with the overwhelming majority relating to threatening or abusive behavior. In other words, the bulk of Scotland’s recorded religious offending crime is conducted on Friday and Saturday nights by young men, often drunk, in the urban west of Scotland. Offenses are overwhelmingly anti-social, abusive and threatening with the most common victims being police, bus drivers, bar staff and the like. We have, then, a vivid picture of urban incivility, a reminder that rather too many Scots – and particularly young men – drink too much, fail to behave themselves and when rebuked respond with foul-mouthed abuse. Depressing certainly, but disproportionately anti-Catholic. Most religious offending is ‘anti-Catholic’ in nature. Yet the seeming disparity in the figures has a simple alternative explanation. Given the broad religious demography of the west of Scotland (where most reported offenses occur), it would require only that a roughly equal (and small) proportion of Catholics and Protestants commit sectarian offenses to produce a supposed ‘imbalance’ in offenses. To put this in simple terms: imagine a town where there are twice as many Protestants than Catholics. In this town, each community has a tiny 0.01 percent minority who indulge in religiously bigoted behavior on an alcohol-fueled Saturday night. In that town, two-thirds of sectarian offenses would inevitably be ‘anti-Catholic’ in nature. This is not to say that in the real world Catholics and Protestants are indulging equally in sectarian hatred – we simply do not have the data to know – only that the underlying disparity in the numbers of Catholics and Protestants points towards a rather less frightening explanation than media coverage suggests. Much has changed in Scotland over the latter half of the twentieth century. Amongst those changes was a very significant decline in the proportion of Scots willing (or able) to treat ‘the other side’ improperly. Indeed – given widespread intermarriage and cross-religion in families and friendships – even knowing who and what ‘the other side’ would even be is becoming increasingly problematic. Knowing our history allows us to see how far we have come. Yet sectarianism is not simply about experiences; it is also about perceptions, anxieties, and family stories. And the more anxious of these perceptions are being fueled by the current siren calls around Catholic victimhood. We have not tried in any way to suggest in this essay that anti-Catholicism is history in Scotland. The Scottish Reformation grew out of strident opposition to the old faith and for well over 300 years after that “anti-Popery” was one of Kirk’s defining markers of identity. Such historic prejudice takes time to fade away. The old feelings can break out in public at Old Firm matches and also inform the views of some (but no means all) of those who oppose denominational schools. Moreover, the Catholic Church takes positions on issues of morality and sexuality with which many Scots today profoundly disagree. That is, of course, perfectly acceptable and understandable within the law. What, however, is unacceptable, is for some politicians and church officials to brazenly spread fear and alarm among the Catholic community on the basis of flawed and incomplete understanding of readily available evidence which is in the public domain. Instead, Scottish Catholics should be rejoicing in recent achievements and in their new place at the heart of mainstream Scottish society. The beast of anti-Catholicism may not be dead, but it is no longer red in tooth and claw. Sir Tom Devine is Sir William Fraser Professor Emeritus of Scottish History and Palaeography in the University of Edinburgh. Dr. Michael Rosie is Senior Lecturer in Sociology at the University of Edinburgh. He was a member of the Scottish Government’s Advisory Group on Tackling Sectarianism but writes here in a personal capacity.